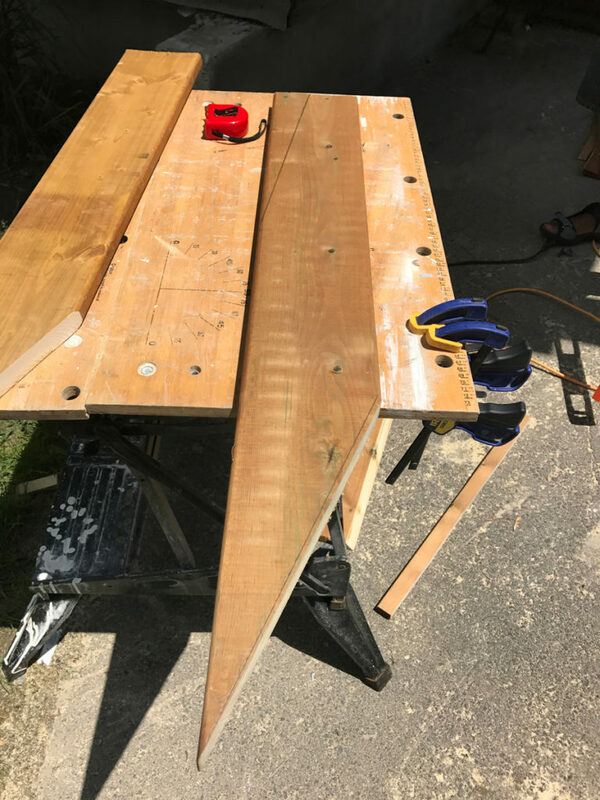 Cut the boards to build the L-Frame (26″). You will need to build 2 of these exactly the same. 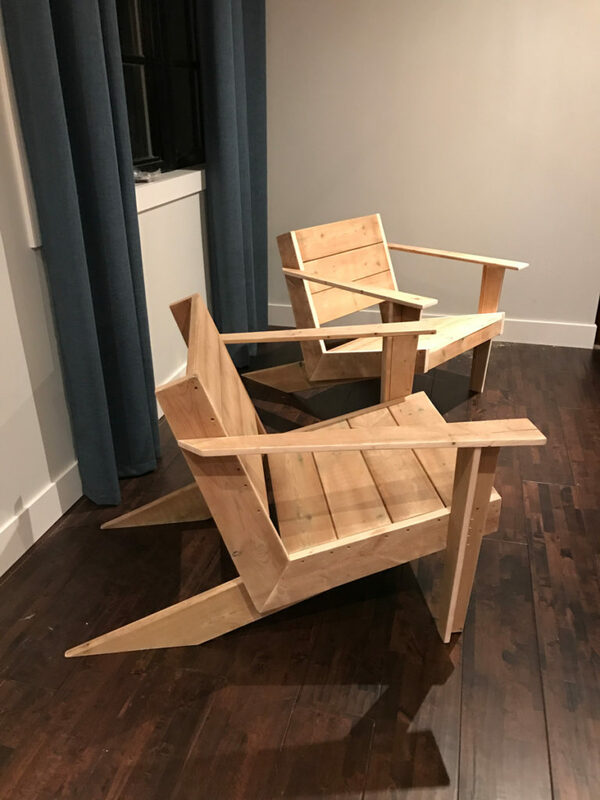 These will become the frame for the back & seating surfaces of the chair. 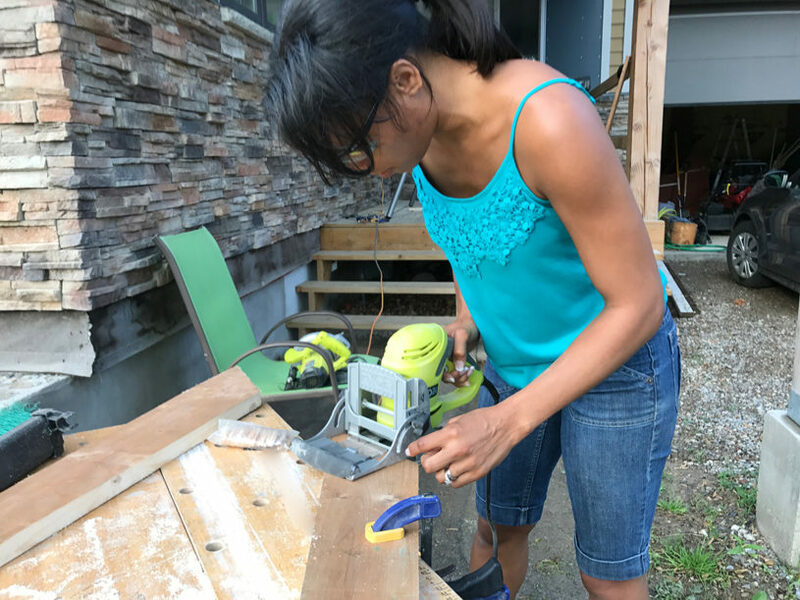 Cut off one beveled edge of each board using a circular saw (or table saw set to 5.25″). Next, using a mitre saw, cut a 42.5 degree angle off one corner. 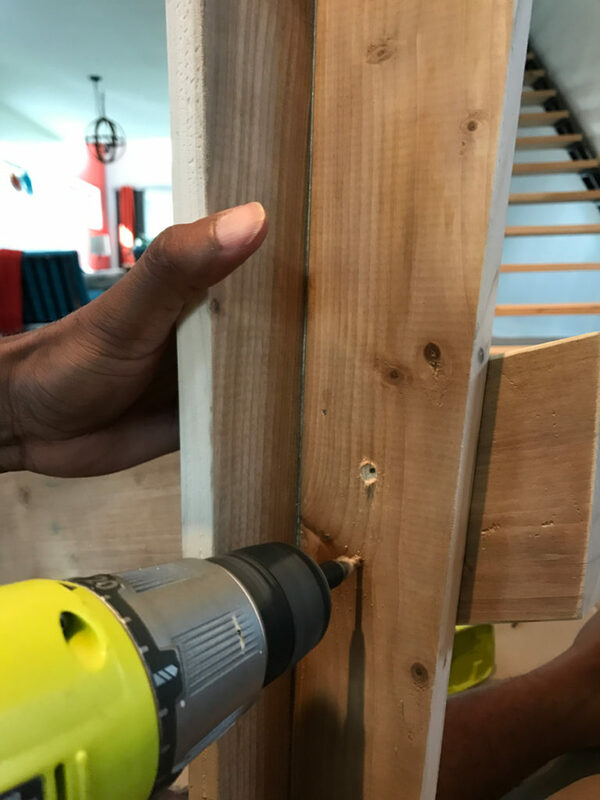 Ensure that when making this cut, the non-beveled, cut edge of the board is against the saw fence. 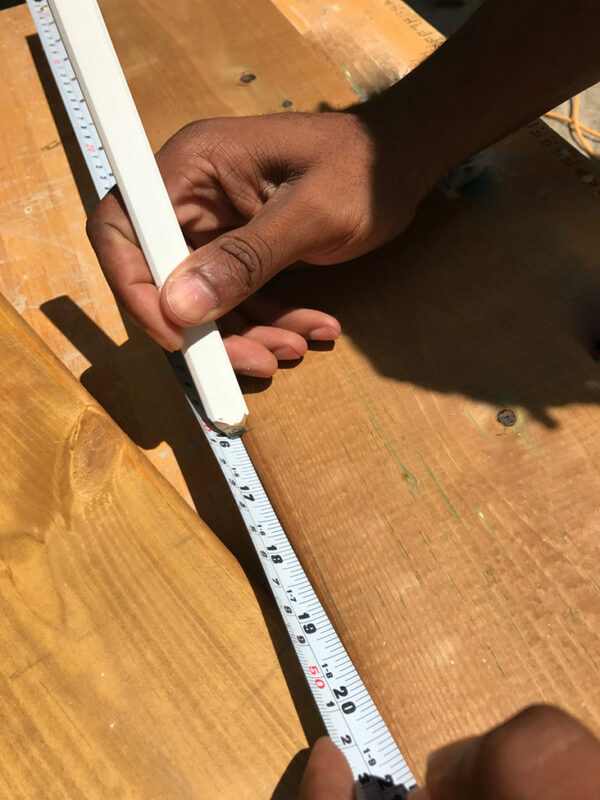 To taper the L-frame, measure 1.5″ in from the beveled edge across from the corner point & mark a straight line from the measurement to the corner point. 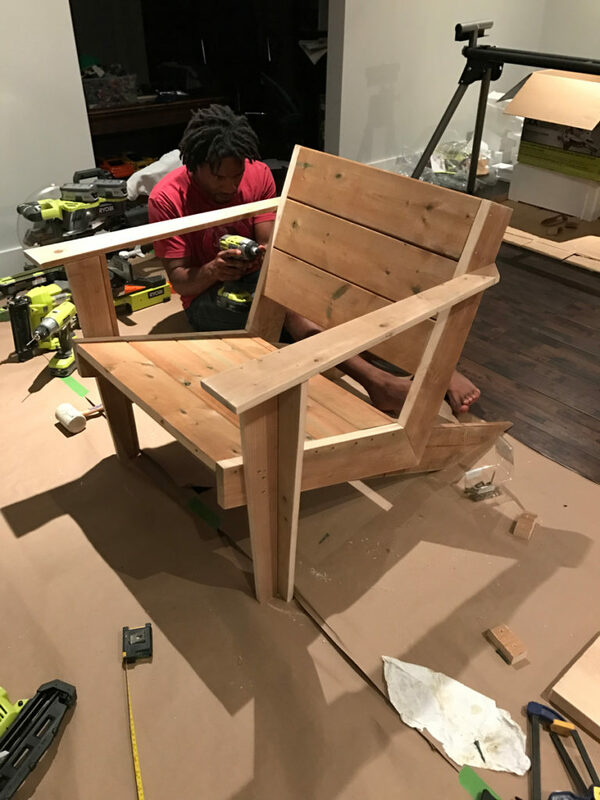 Cut using a circular saw. 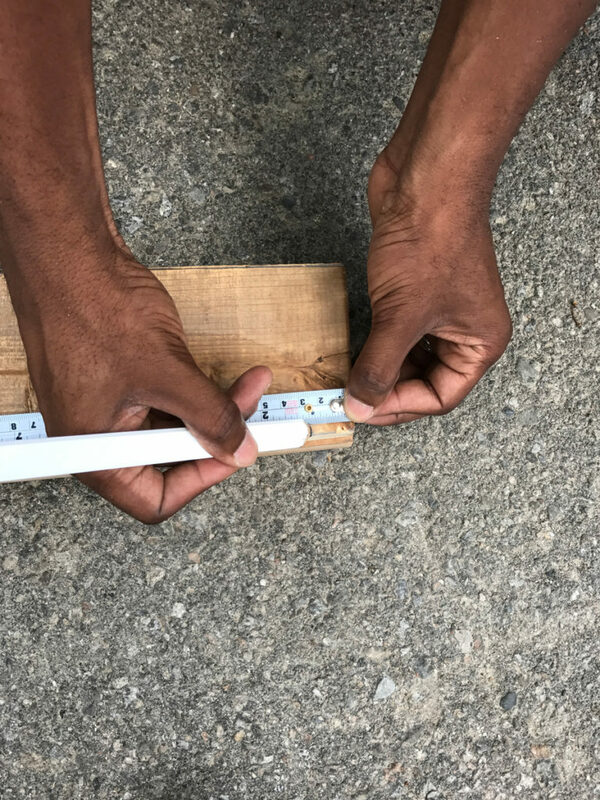 On one of the 2 boards, measure 1″ in from the bottom of the short edge. Draw a line to the top corner & cut. 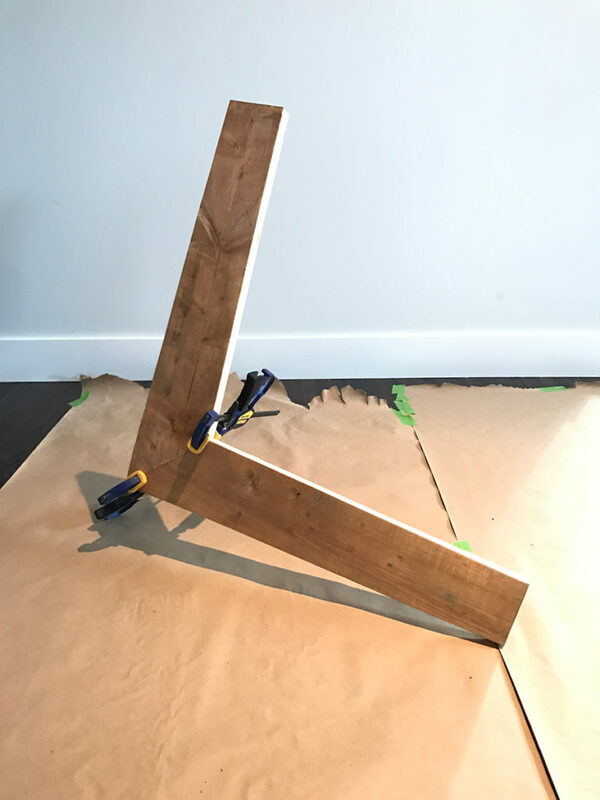 This piece becomes frame of the seating surface or the ‘front’ of the L.
Using a biscuit joiner & wood glue, attach the 2 boards along the angled edges to form an L shape. 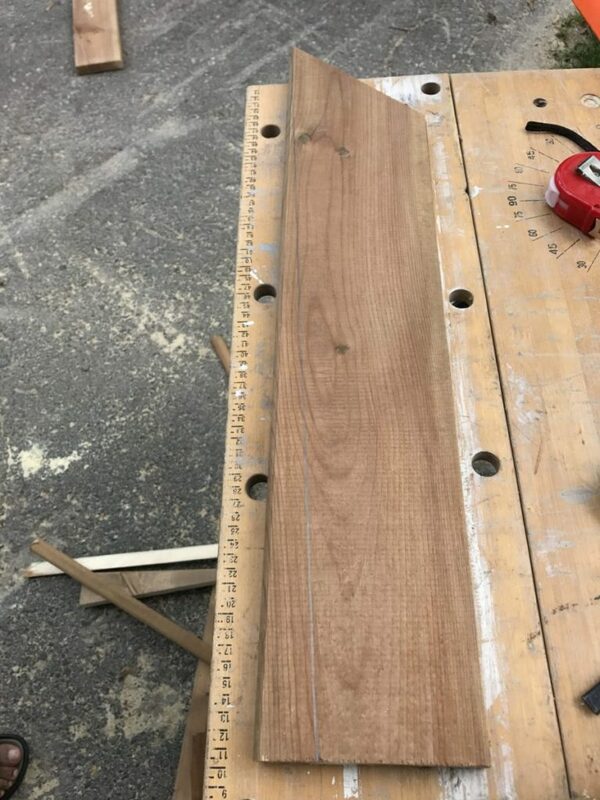 Cut the boards for the Rear Legs (40″). You will need to cut two of these that are identical. 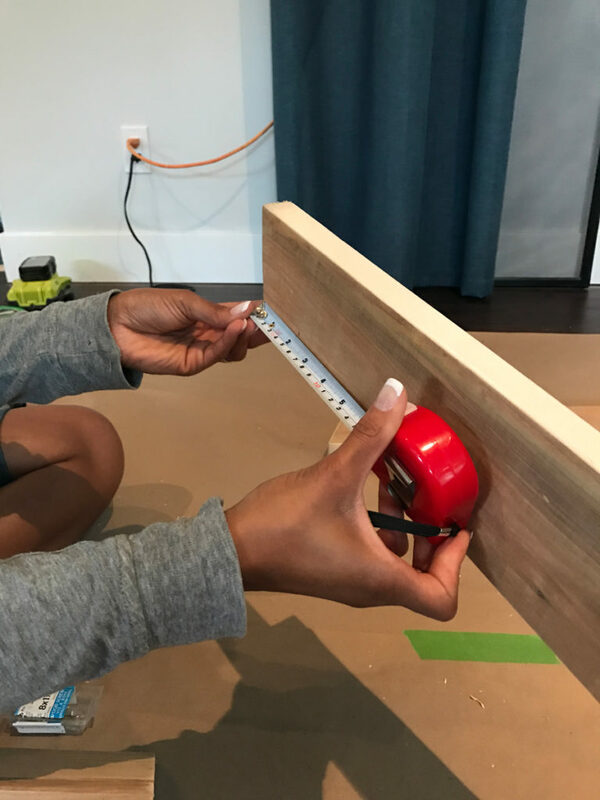 Measure & mark 12 1/2″ along the side edge of the board. 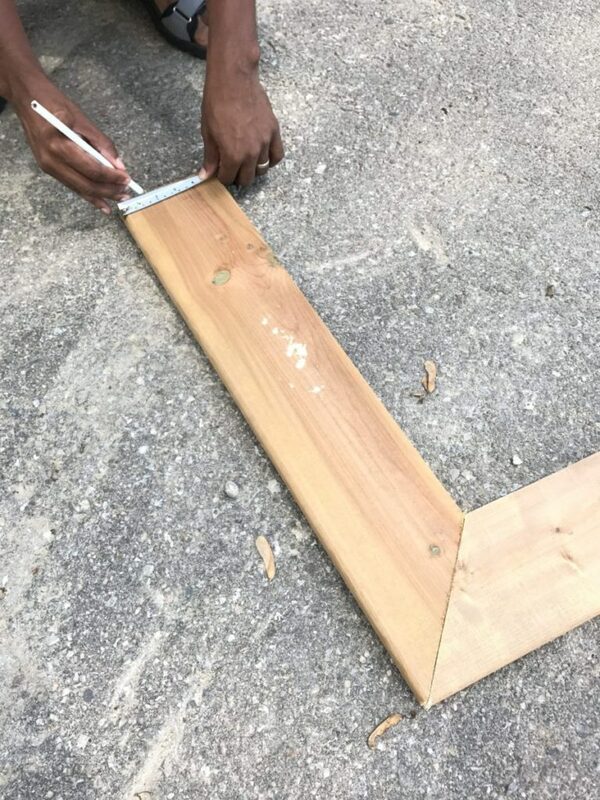 Draw a straight line to the opposite corner & cut using a circular saw, creating an angled edge with a pointed end. 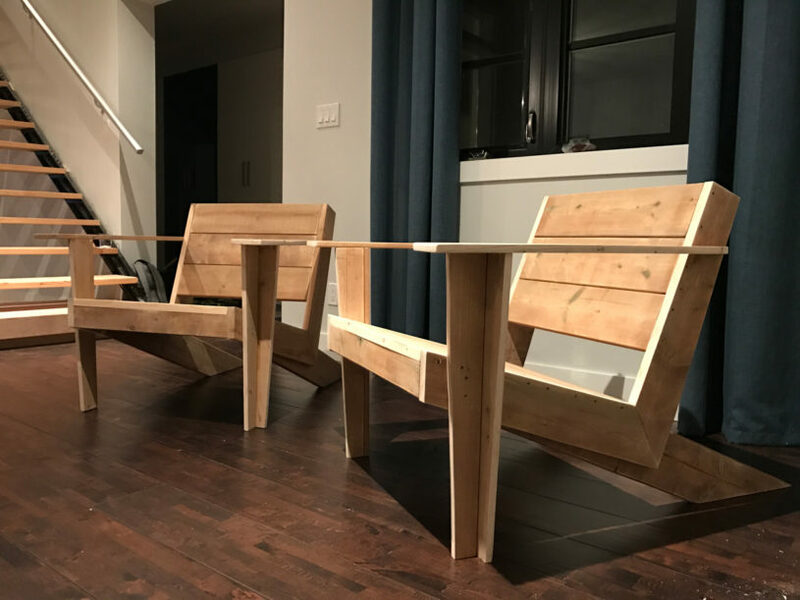 This angled edge will sit on the floor when the chair is assembled. 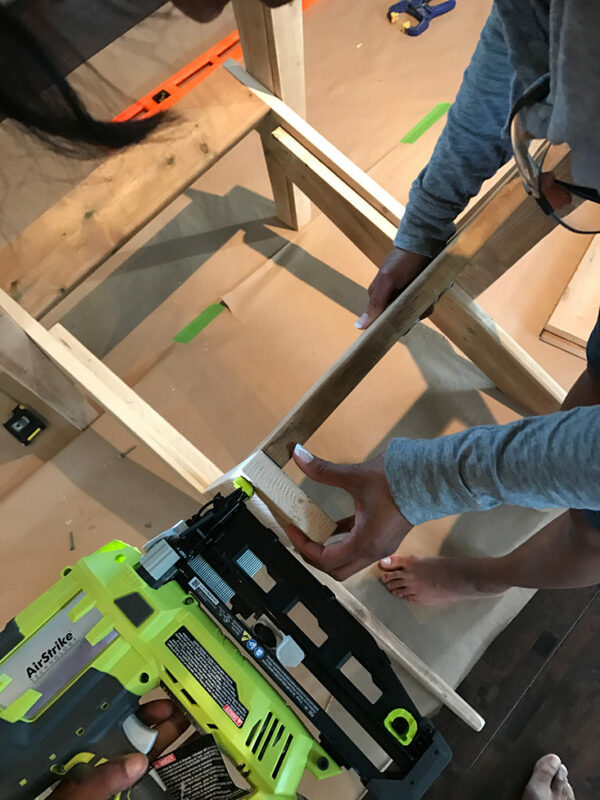 At the opposite end of the board, measure 2 3/8″ in from the corner that is diagonally opposite to the cut angle. 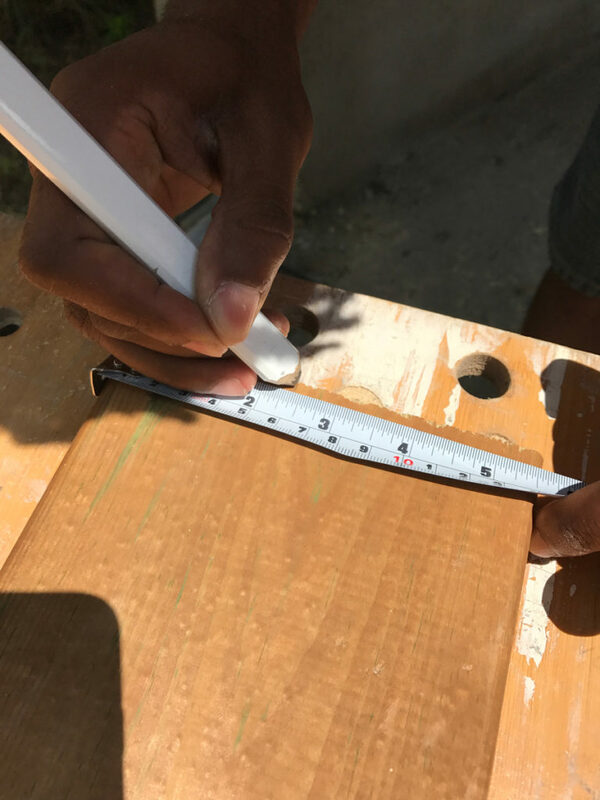 Then measure 16″ along the same straight edge & draw a line connecting the 2 marks. 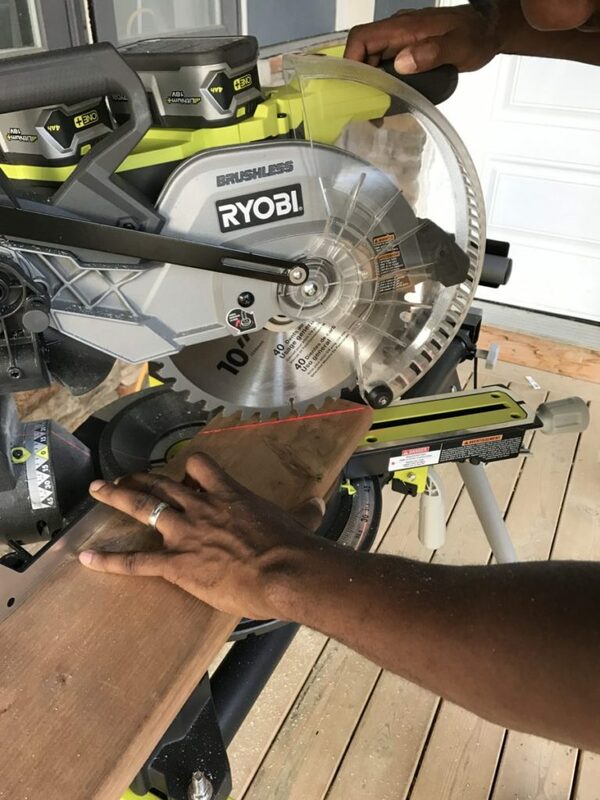 Using a circular saw cut along the angled line. 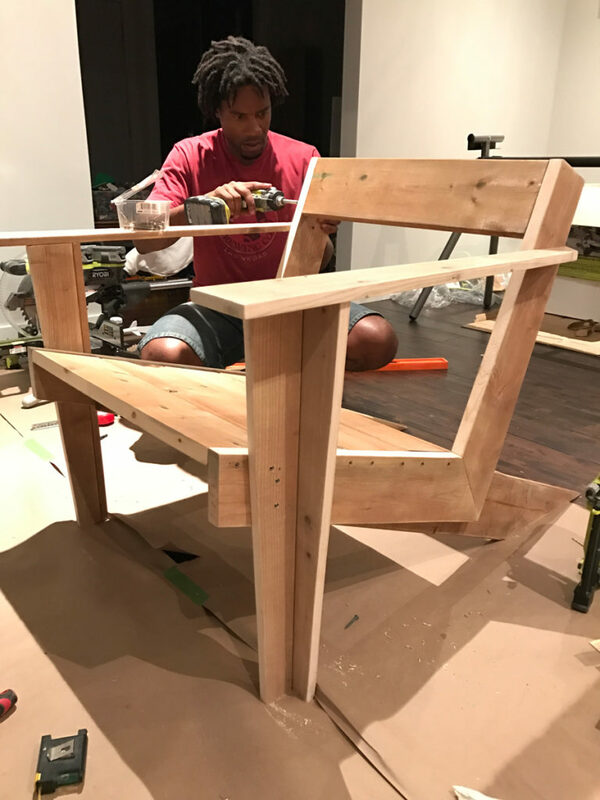 Draw a straight line 1″ down from the seating surface and 6″ from the front on the inside of each L-frame. 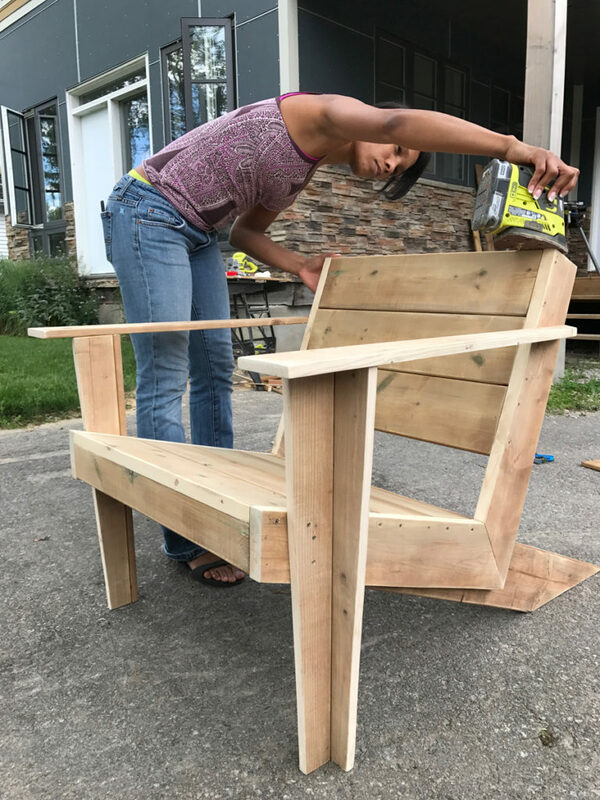 Using wood glue, & 1 1/2″ screws, attach the rear legs to the inside of the L-frame aligning the top edge of the rear leg along the drawn line. 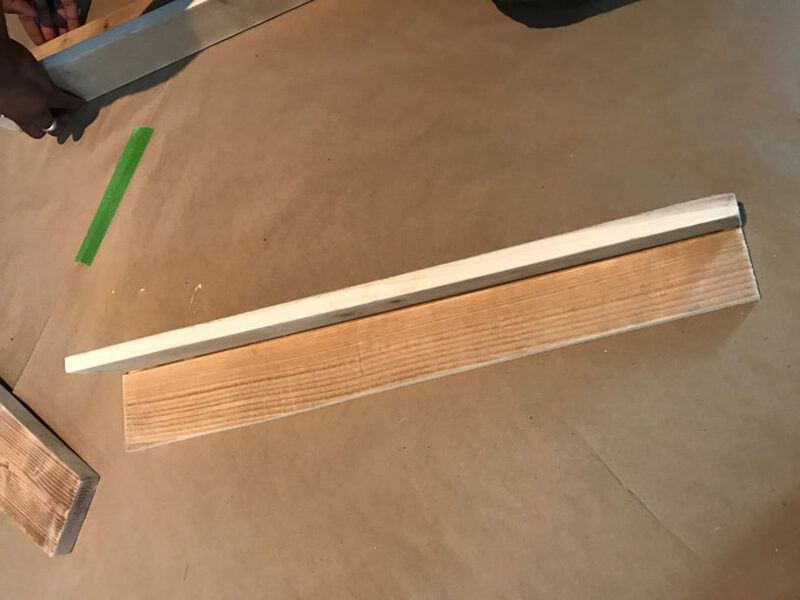 Cut the boards for the Arm Supports (24″). 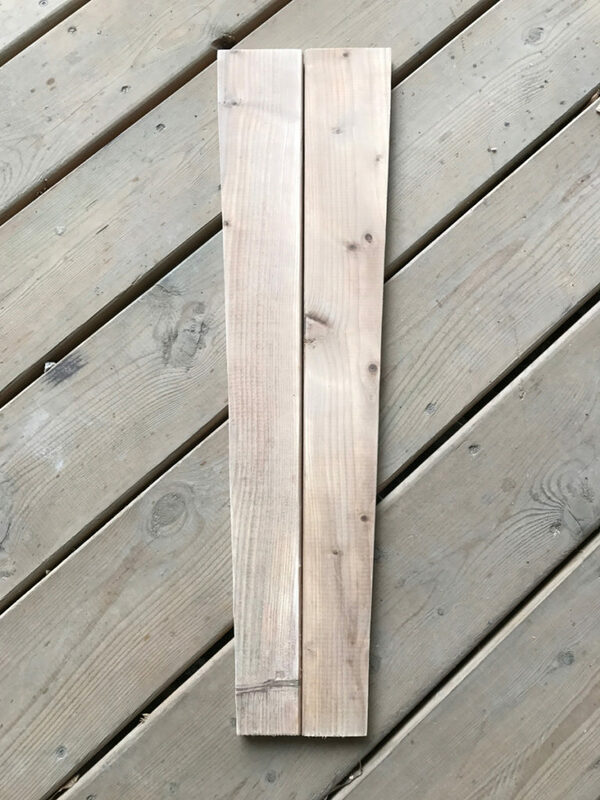 You will be cutting each board into two identical pieces. 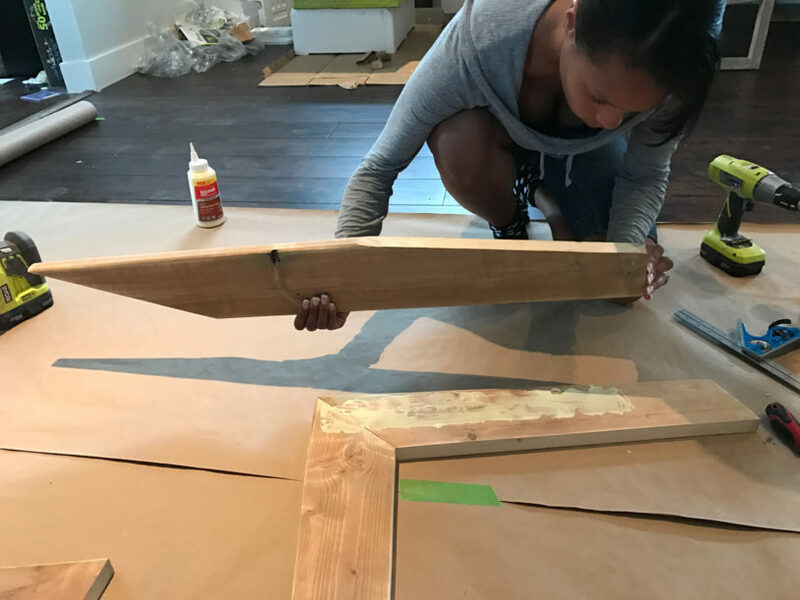 Take each 24″ board & measure in 2″ toward the centre from each opposite edge. 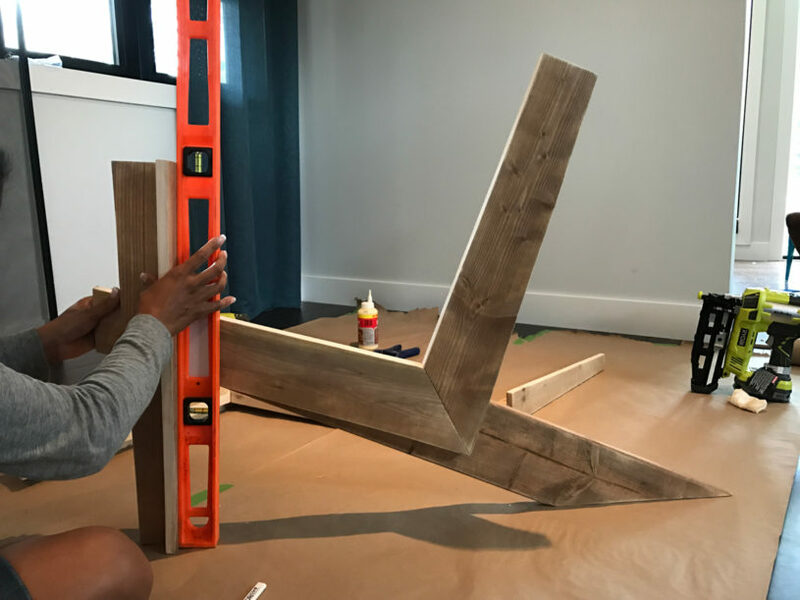 Mark a diagonal line from each measurement point & cut lengthwise using a circular saw to make 2 somewhat triangular shaped pieces. 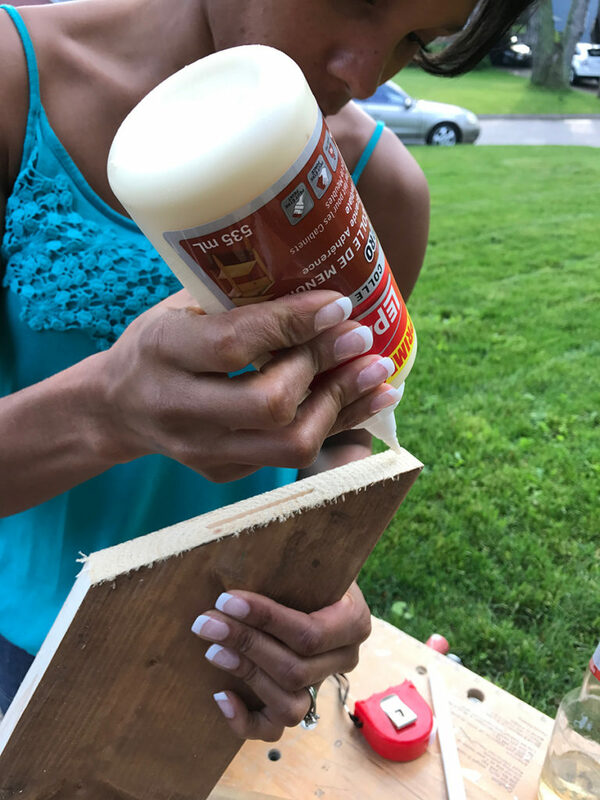 Glue along the straight (uncut) edges & join triangular boards using the nailer to form a long L shape. 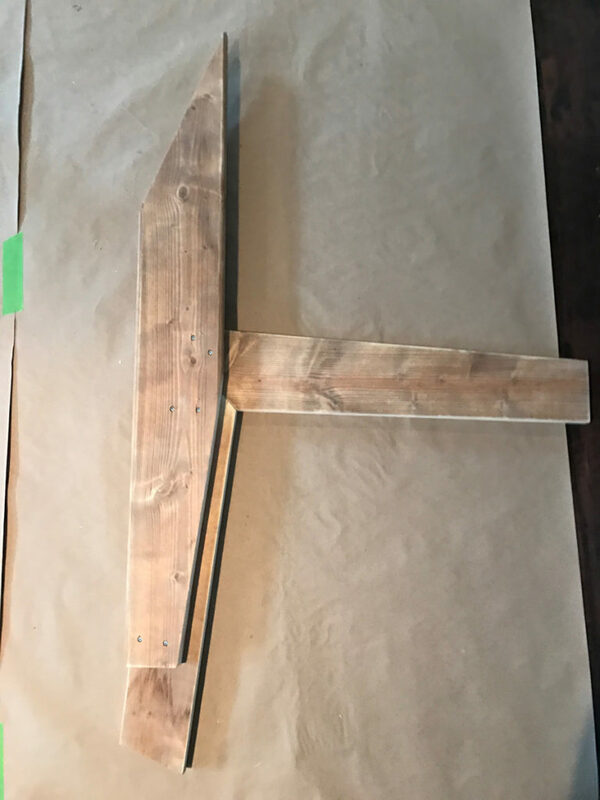 Mark 5 1/4″ from the front of the seating surface on the L-frame. 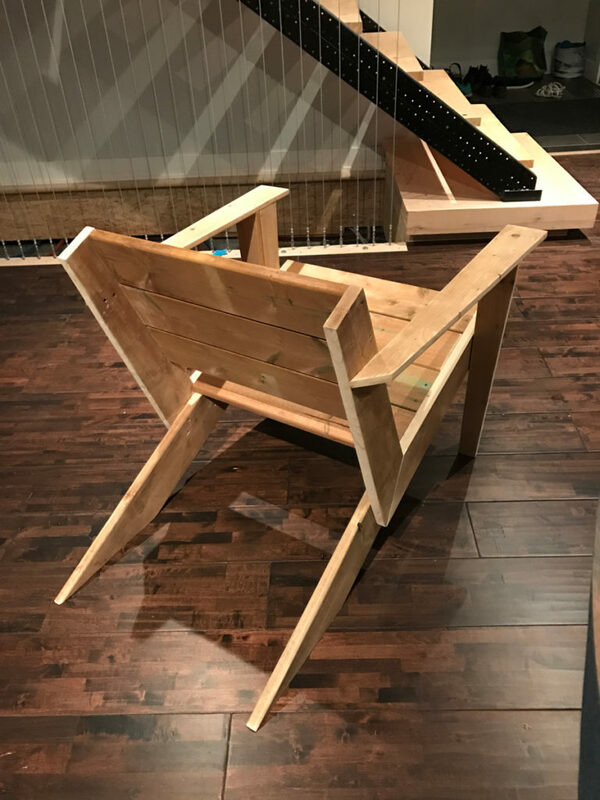 Attach the arm supports to the outside of the L frame aligning the back of the arm support to your mark & ensuring the rear leg is flush to the ground. 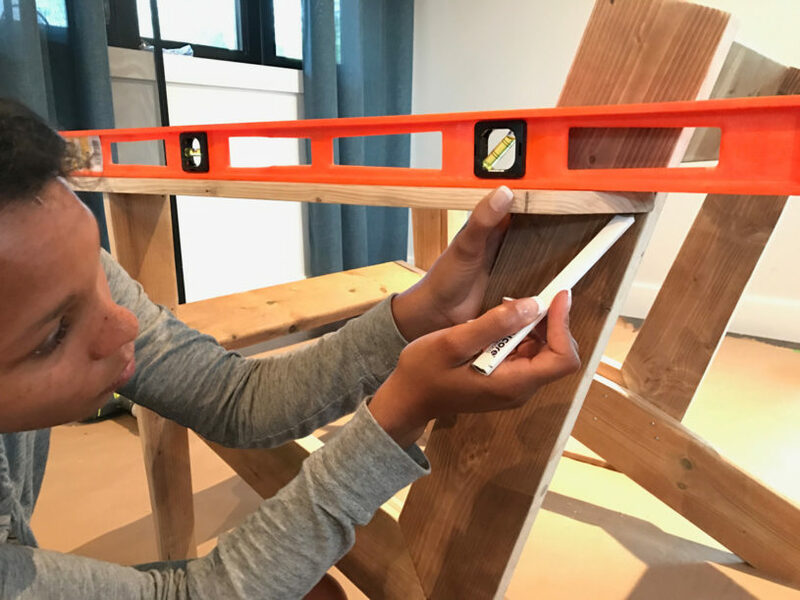 Use a level to ensure the arm support is plumb. 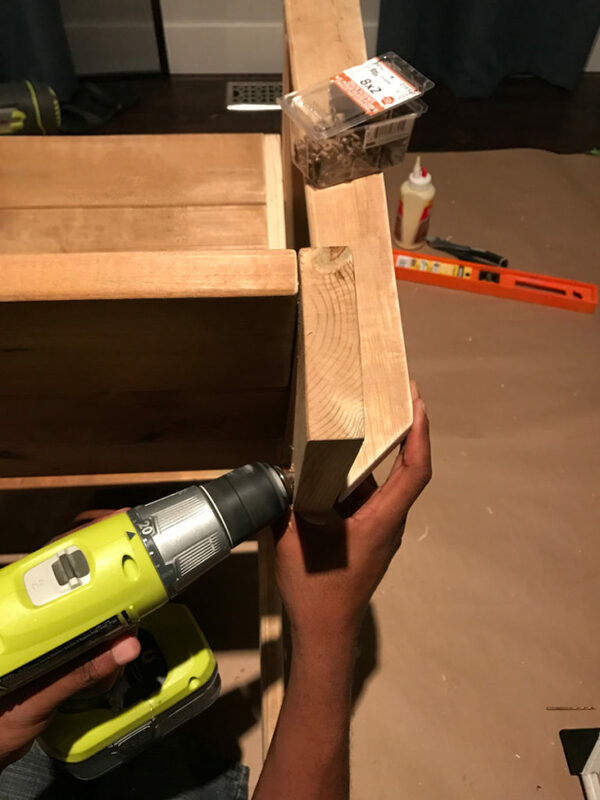 Pro tip – tack each arm support in place using a brad nailer then secure with 1 1/2″ screws. 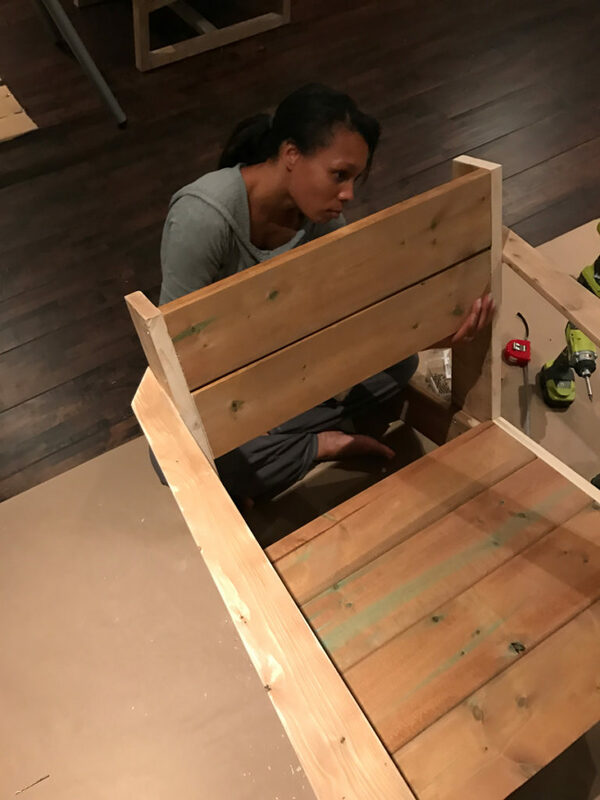 Cut the boards for the seating surface & back (23.5″). 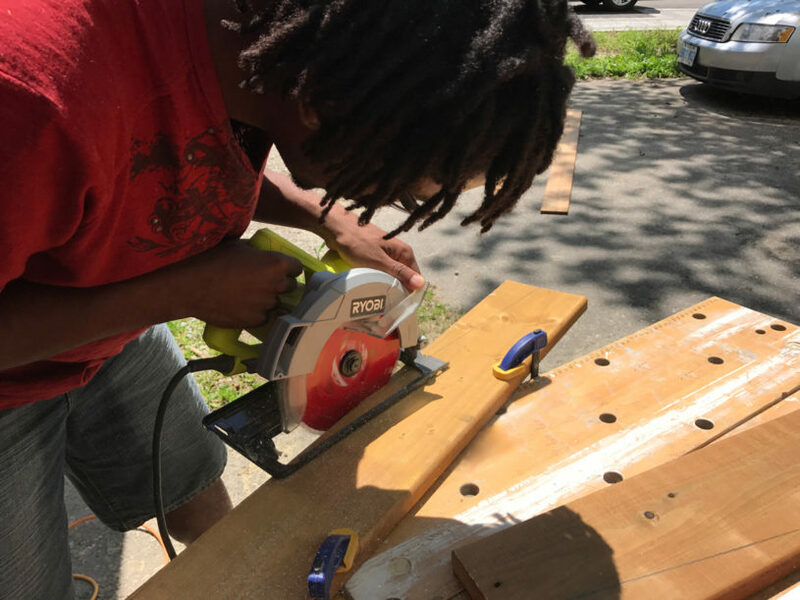 Take one of the boards and rip the front edge at a 15 degree angle using using a table (or circular) saw. This will match the angle at the front of the L-frame. 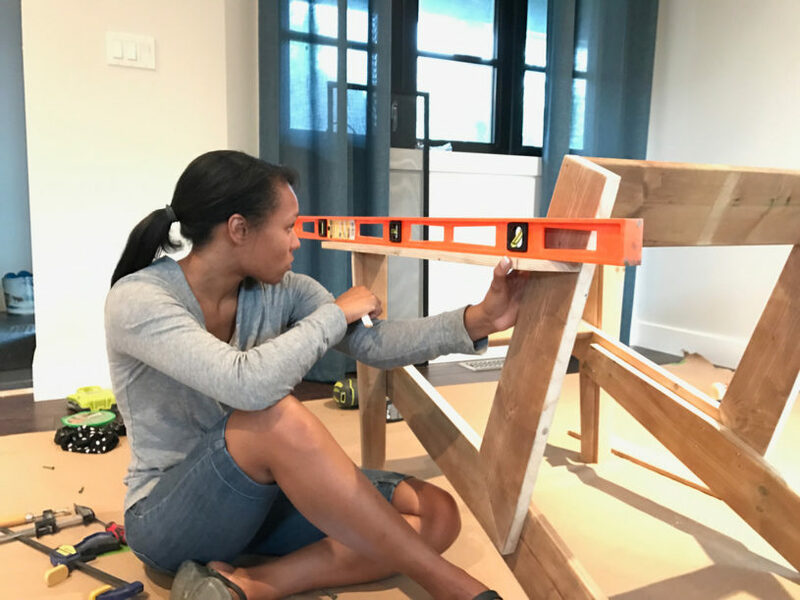 Using a nailer, connect the 2 sides of the L-frame by attaching the ripped board to the front of the seating surface and a second full sized board to the top of the back frame. Once nailed in place the chair frame will stand on it’s own. 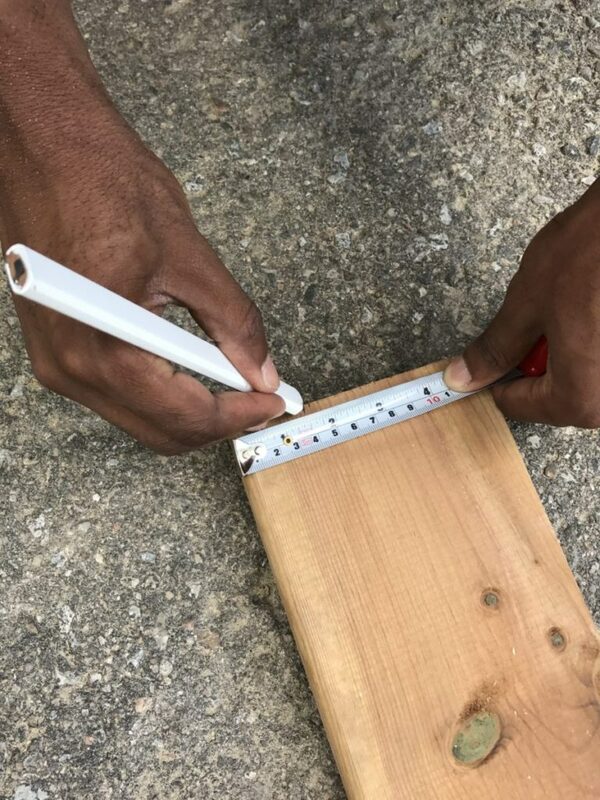 Secure the boards by countersinking 2″ screws through each side of the L-frame. Repeat to attach the remaining 3 seating boards. 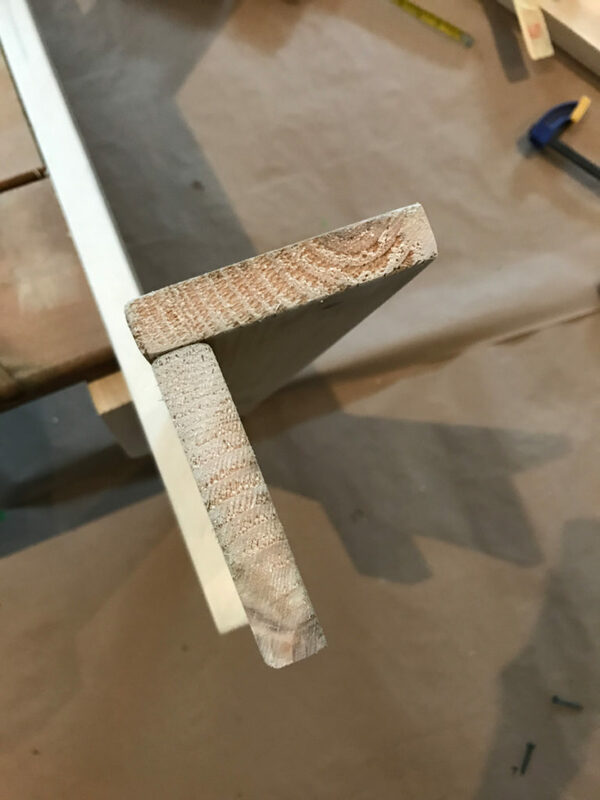 Cut the boards for the Armrests (31.5″). You will need to cut 2 identical pieces. 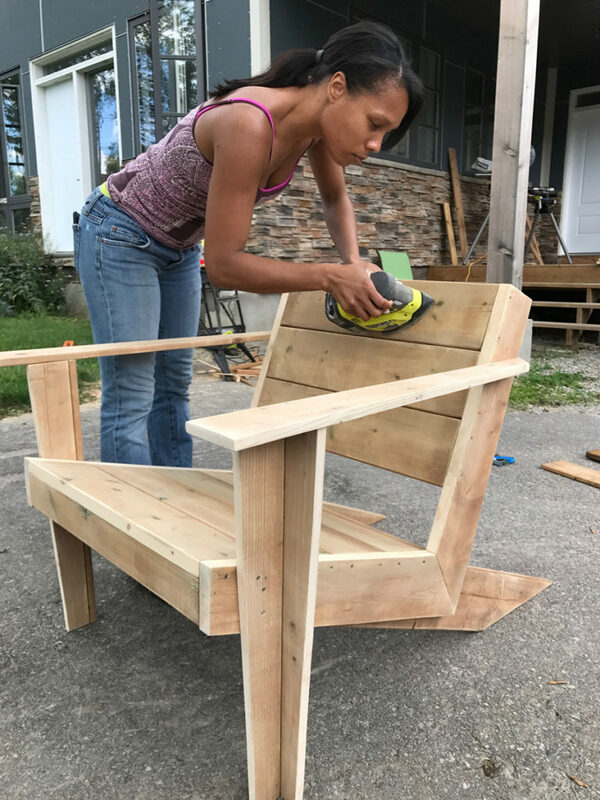 Similar to the Arm Supports above, measure 4″ toward the center at one end of the board & 2″ toward the center at the opposite end of board. 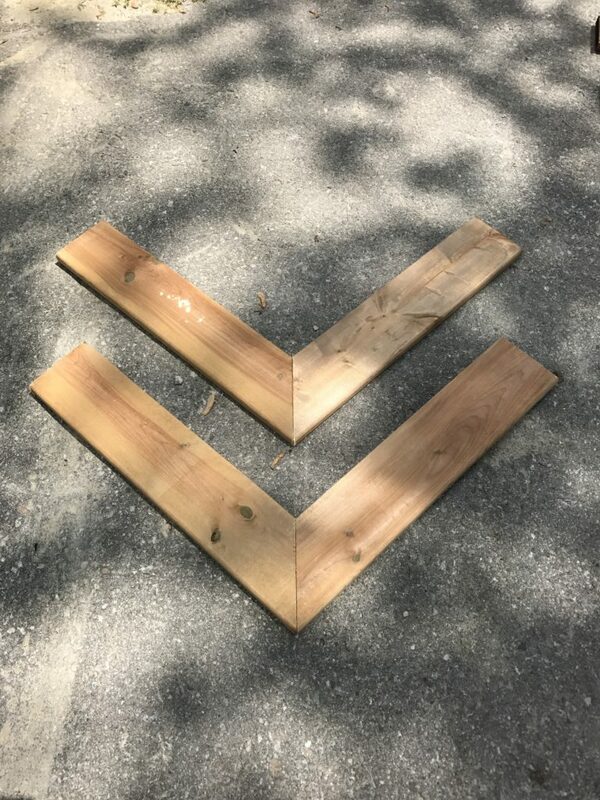 Mark a diagonal line from each measurement point & cut lengthwise to make a triangular piece. 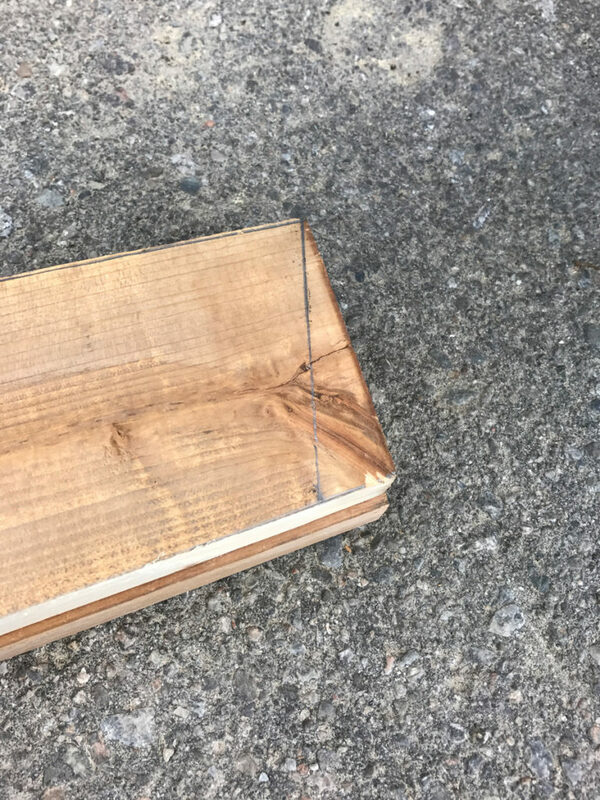 Using a mitre saw, cut a 45 degree angle toward the straight edge at the 2″ end of the board. Place the armrest on the arm support aligning the back of the armrest to the back of the L-frame. 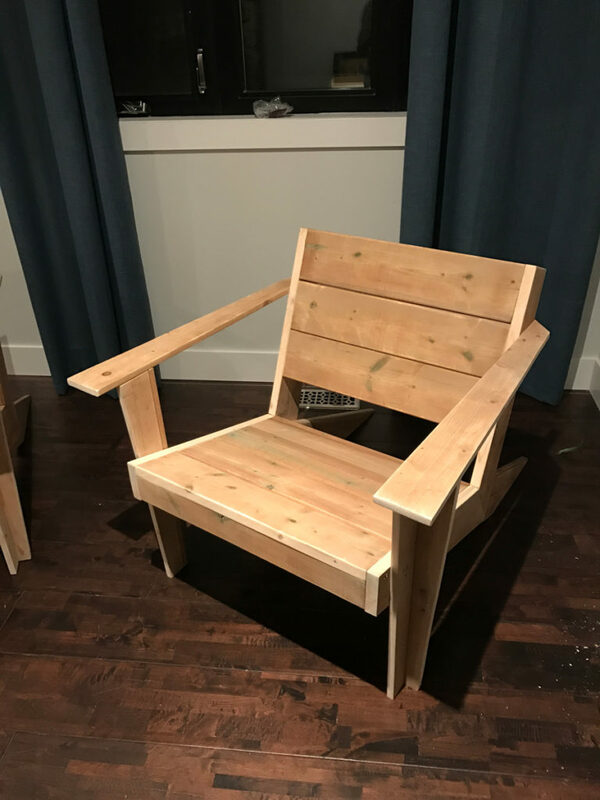 Using a level, draw a line to find the point the armrests will be attached. 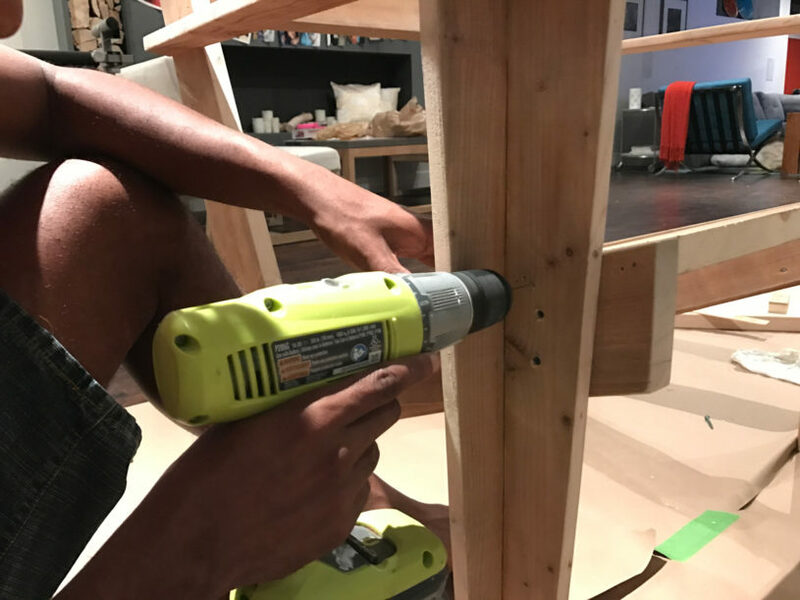 Tack the armrest in place using a brad nailer. 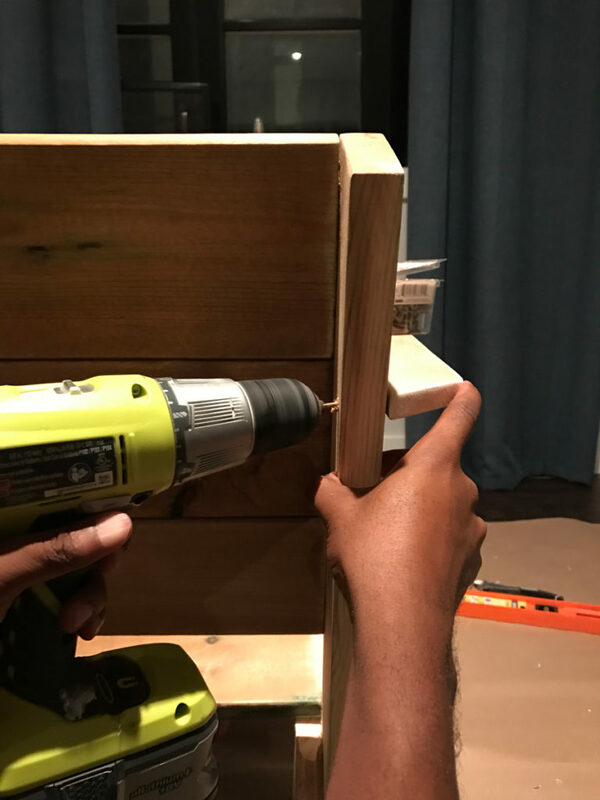 Attach the armrest to the top of the arm supports using glue & 2/5″ finishing nails. 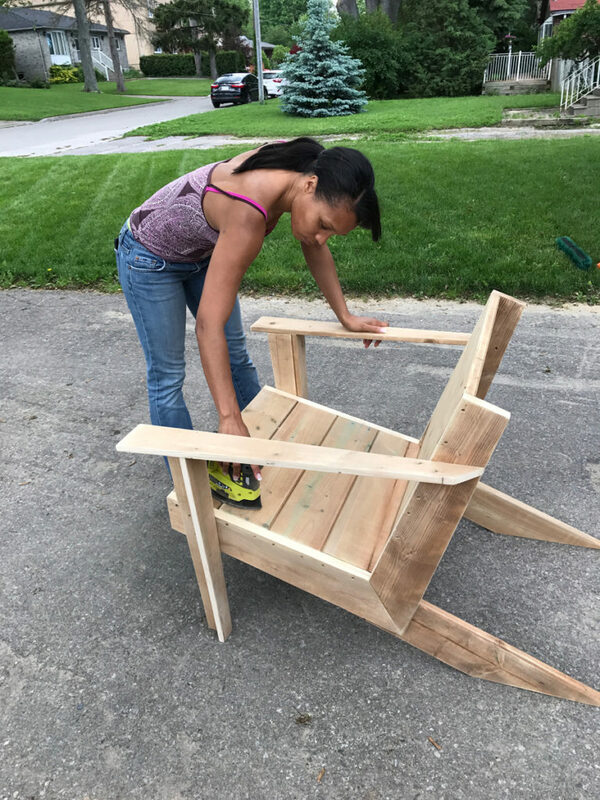 Attach the remaining 2 chair back boards to the upright part of the L-frame & secure with 2″ screws. 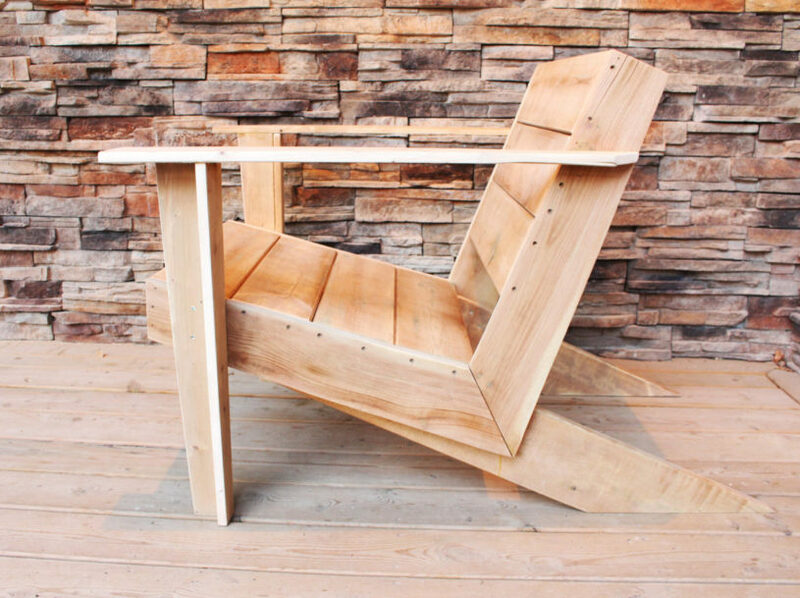 To secure the armrests, countersink 2″ screws through the inside of the L-frame from behind the seat back. Pro tip: Drive the screws on an angle to match the rear angle of the armrest. Measure the distance from the bottom of the front seat board to the bottom of the L-frame (should be approx. 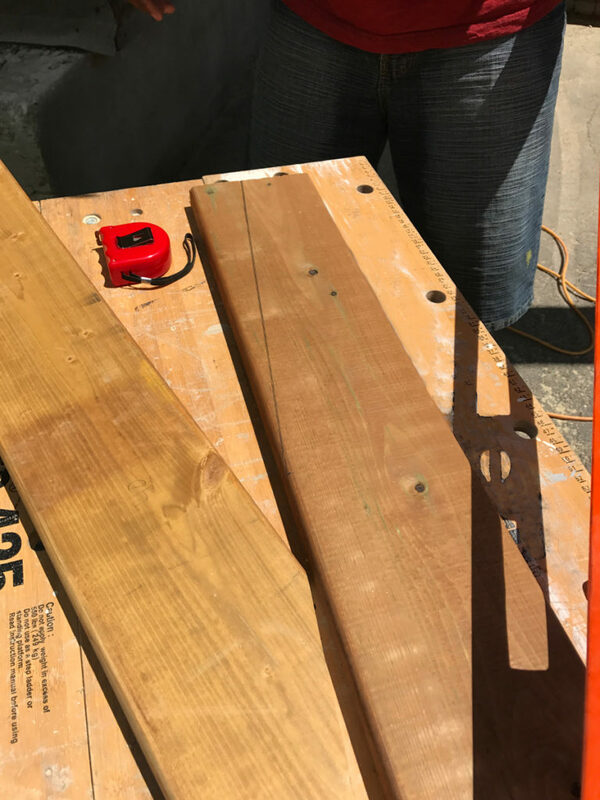 3″) and using a table or circular saw set to a 30 degree angle, rip the last remaining 23.5″ board down to your measurement. 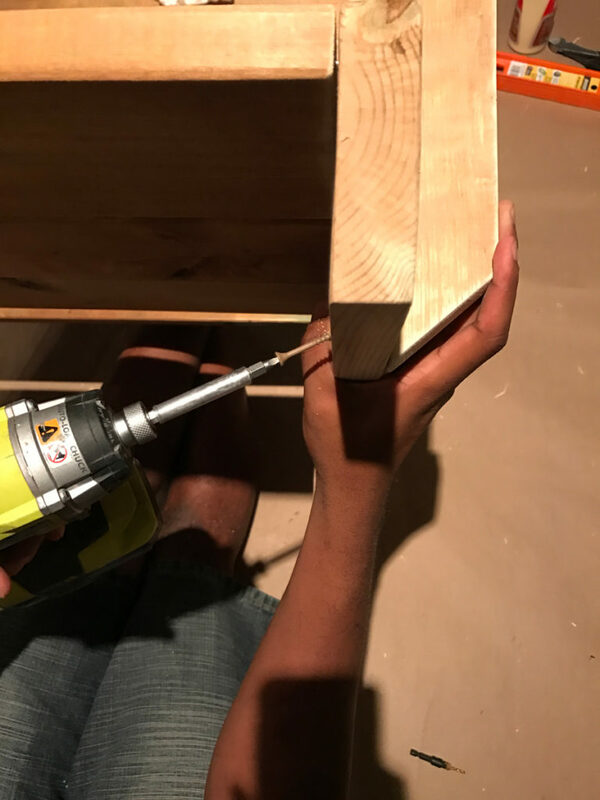 Attach the trim piece to the L-frame using the finish nailer. 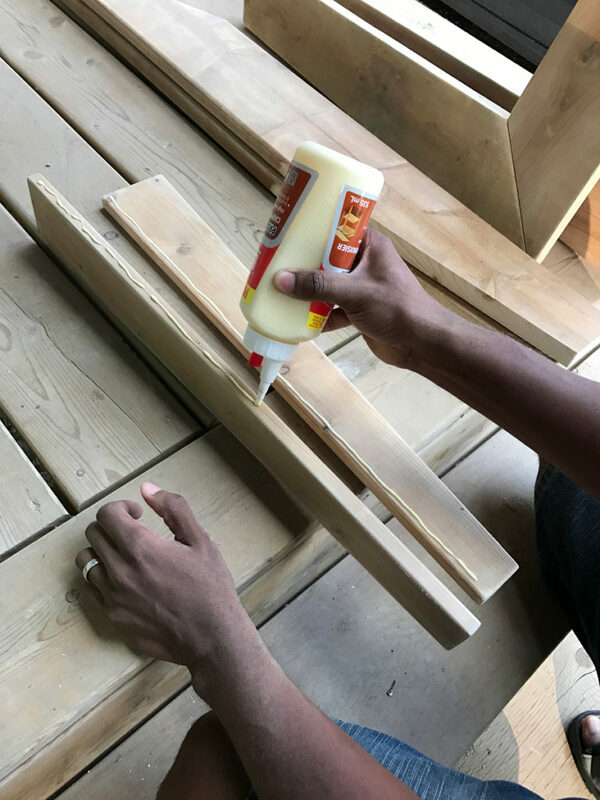 Fill any screw or nail or holes, then sand and finish as desired. Annnnd you’re done!! Go ahead and admire your work from all angles! 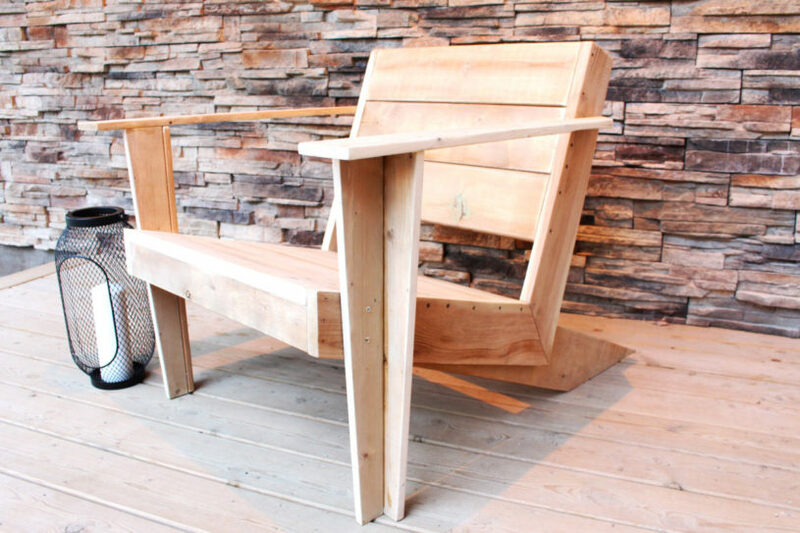 We must send a huuge thanks to our friends at RYOBI Canada for partnering with us to build these chairs. We’re definitely ready to celebrate Canada’s 150 enjoying the outdoors! 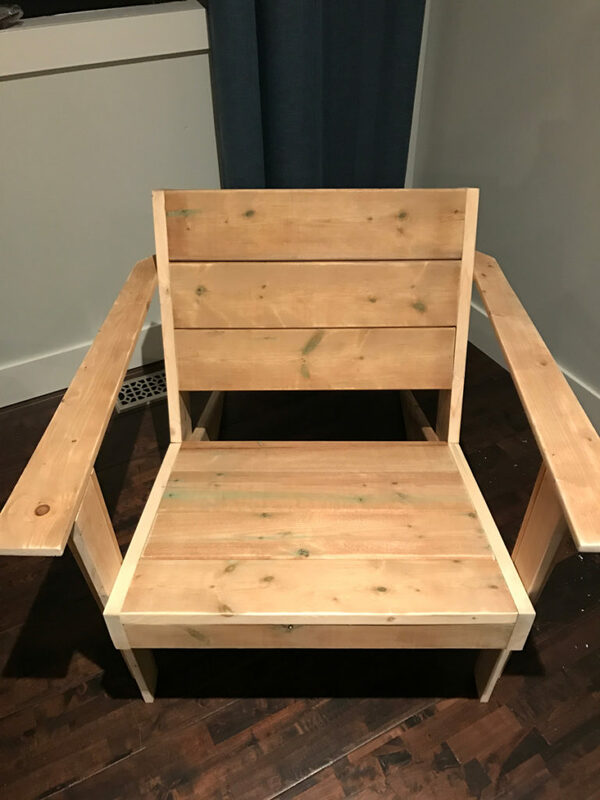 This project was sponsored by RYOBI Canada. 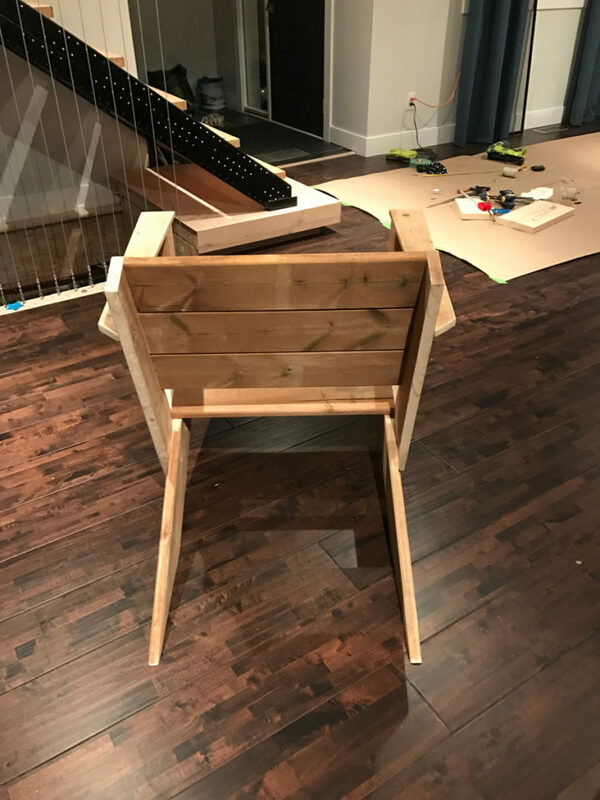 Tools & materials used in this post were provided by RYOBI, however opinions expressed are entirely our own. 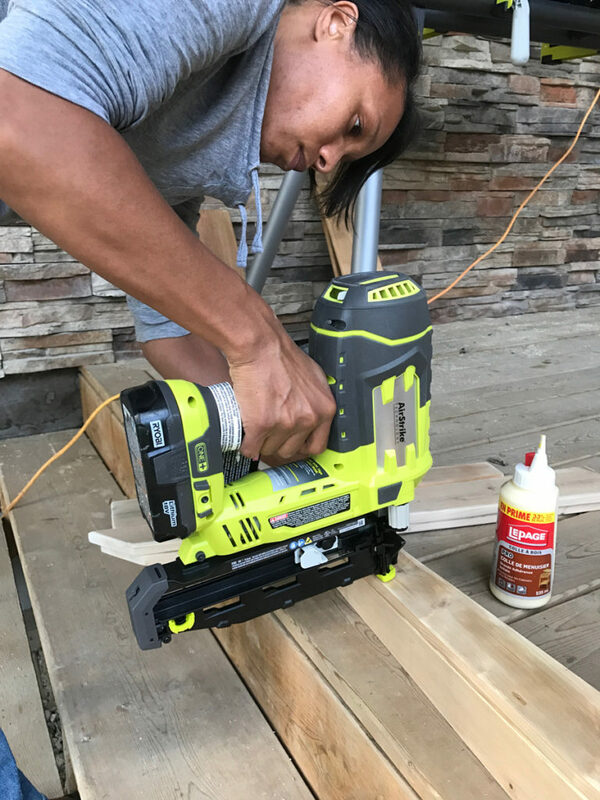 RYOBI Tools are available exclusively at the Home Depot.